She calls this a Sushritto, inspired by a restaurant serving a sushi - burrito fusion in California, but to spare some calories and time I prefer to leave out the rice. Given the lack of rice, and the fact that this is pretty similar to a traditional Japenese temaki roll, perhaps we should just henceforth go with "smoked salmon temaki." The fun part about this wrap is figuring out what to put inside! For me, smoked salmon is the perfect base, especially if I can get my hands on cheaper smoked salmon from Trader Joe's or Costco. I topped my salmon with homemade fermented carrot ginger slaw (highly recommended) and a sweet furikake seasoning I picked up on my first-ever exploration of Wegman's. Cucumbers, of course, are one of my absolute favorites and a must have. I hear this is fabulous with avocado, mushrooms, bean sprouts, cabbage, or any other vegetables you enjoy. This wrap is perfect to bring to work for lunch - just wrap in parchment paper or tin foil. 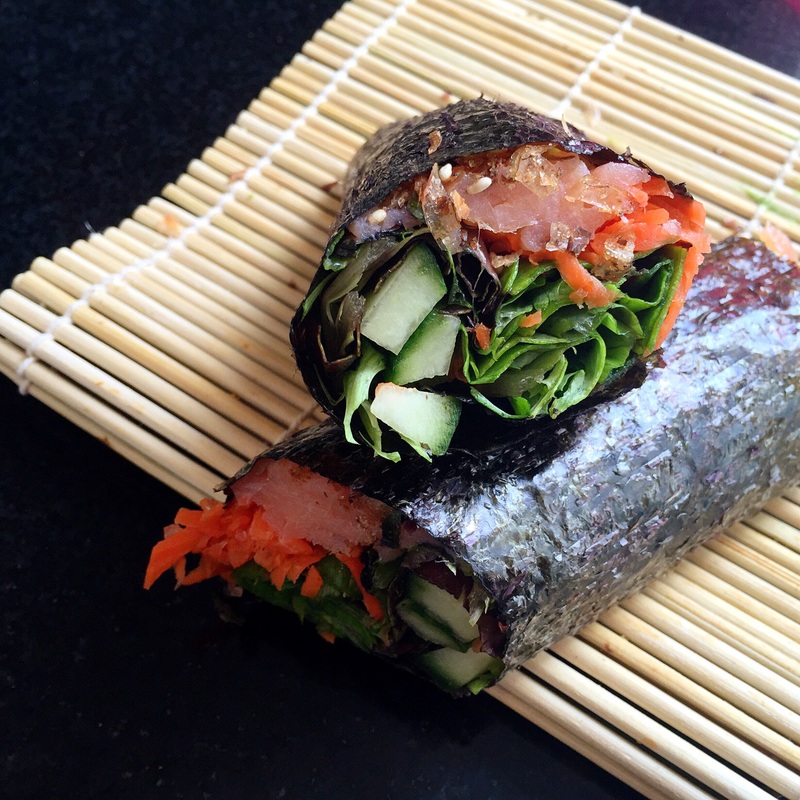 Lie nori flat on something flexible - plastic wrap, parchment paper or foil will do if you don't have a sushi mat. Carefully roll up your wrap - pull the edge of nori closest to you up and over the filling, tuck it around all the filling if you can, then roll the whole thing over onto the other edge. Cut in half and eat right away, or tie off the ends of parchment paper / foil to keep for later in the fridge or pack for lunch. Dip in soy sauce (like sushi) when you eat it. Whatever you like with sushi - wasabi paste, pickled ginger, etc - will be very tasty added to this. I hear it's also great with a layer of avocado inside, but I'm allergic so I can neither confirm nor deny.